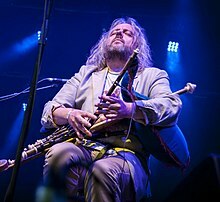 Troy Donockley (born 30 May 1964) is an English composer and multi-instrumentalist most known for his playing of Uilleann pipes. Having performed with many artists as a session player, he is most notable as a member of Finnish symphonic metal band Nightwish, which he has performed with since 2007 and joined as a full-time member in 2013. Donockley was born in Workington, Cumbria; his parents were members of a band called Travelling Country. At the age of 16, Troy joined them, playing at many venues in West Cumbria. His father's record collection was broad and gave his son a love of classical, rock, country as well as traditional music. He is a multi-instrumentalist and a master of the Uilleann pipes. His ambition as a teenager was to travel the world as a musician, but hated "empty pop created by cynical twerps". The strangeness of the sound of the Uilleann pipes enabled him to become a session musician with prog-rockers The Enid in 1987 on their album 'The Seed and the Sower'. In 1987, he formed Celtic Rock band 'You Slosh', recording 'Glorious Racket' with them in 1989. In the following year, he recorded as a session musician with Celtic-folk band Iona. This was at the very beginning of the boom in Celtic-folk bands, and both ventures were very successful. Donockley recorded one more album with You Slosh in 1991, plus nine more albums with Iona. He became an official member of the group in 1995 and left the band in 2009. Máire Brennan, a member of the best-known Celtic-folk group, Clannad, called on Donockley to be a session musician on 'Two Horizons'. In 1999, Donockley recorded 'Our Kate' on the album 'Debatable Lands' by Kathryn Tickell, contrasting two types of pipes with her; she plays the Northumbrian smallpipes. Together with Adrian Edmondson, Donockley founded the band The Bad Shepherds in 2008, performing punk and new wave classics on folk instruments. Both Barbara Dickson and Maddy Prior lived in the north of England and Donockley met them both. Alongside her easy listening albums, Dickson also recorded folk albums. In 1994, and again in 2004, Donockley was a session musician for Dickson's folk albums and then went on to produce several of her albums including 'Words Unspoken' (2010) and 'To Each & Everyone - The Songs of Gerry Rafferty' (2013) . After recording Flesh and Blood with Prior in 1997, Donockley also became co-producer of her next four solo albums. Donockley with Nightwish in 2007. Donockley's first appearance with Nightwish was on their 2007 release, Dark Passion Play, as a guest musician, providing some whistles and pipes to the songs "The Islander", "Last of the Wilds", and "Meadows of Heaven". He also joined them on select shows of the subsequent tour and appeared in the music video for "The Islander". In 2011, Donockley appeared as a guest on Imaginaerum, providing whistles, pipes, and vocals. He joined Nightwish again on the Imaginaerum World Tour, and also appeared on the band's concert DVD 'Showtime, Storytime'. He also appears in the Imaginaerum film from 2012 as a stage illusionist. Following the conclusion of the Imaginaerum World Tour, Donockley was made a full-time member of Nightwish in October 2013. Donockley has recorded as a session musician with Roy Harper, Midge Ure, Del Amitri, Alan Stivell and Status Quo. Bruce Johnson of the Beach Boys has used him. Eight studio albums by prog-rockers Mostly Autumn feature him, as do Welsh prog group Magenta on two albums. He also performed on Etarlis, a 2007 release by Mermaid Kiss. He can be heard on recent movie soundtracks Robin Hood (Ridley Scott, 2010) and Ironclad (Jonathan English, 2011). Notably, he also performed at the Scottish leg of Live 8 with Midge Ure. Donockley has composed music for choir and orchestra. He has gone to great lengths to find the right kind of studio production. The Unseen Stream (1998) and The Pursuit of Illusion (2003) put the uilleann pipes in a sound mix that had never been heard before. His latest classical work is The Madness of Crowds (2009). ^ "Nightwish – Ms. Floor Jansen is a keeper. Also, we will..." Facebook.com. Retrieved 28 July 2014. ^ "The Madness of Crowds | The Pursuit of Illusion | The Unseen Stream | Uilleann Pipes | Low Whistle". Troy Donockley. Retrieved 28 July 2014. ^ "Barbara Dickson Online - The Band". 6 September 2006. Archived from the original on 6 September 2006. Retrieved 7 August 2018. ^ "Debateable Lands - Townsend Records". 28 September 2007. Archived from the original on 28 September 2007. Retrieved 7 August 2018. ^ "The Bad Shepherds". Thebadshepherds.com. Retrieved 18 August 2009. ^ Martin Kielty (12 August 2014). "Teamrock News: Donockley, Nolan, Stevens and Mitchell guest with Gandalf's Fist". Teamrock.com. Retrieved 17 August 2014. ^ "The Ninth Hour (2016)". The Ninthe Hour at Sonata Arctica official website. Retrieved 12 November 2016.